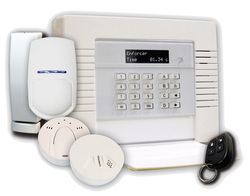 We are a leading Service Provider of burglar alarm systems from Mumbai, India. We are engaged in offering quality range of burglar detection system, which is highly demanded by our clients, spread worldwide. These burglar detection system are manufactured from quality-tested components and are most commonly performed by motion detectors, glass break sensors and door opening sensors. Notification is provided by horns, strobes and remote notification with the help of telephone using an auto dialer server to intimate the concerned personnel immediately. Looking for Burglar Alarm Systems ?